In an age when austerity might increasingly be the new normal, one thing is not in short supply. Dylan covers. I was recently given the new 4-cd compilation of Dylan covers benefitting the work of Amnesty International. 73 covers. 73 different artists. 73 different songs. Everyone from Adele to Ziggy Marley. It’s overwhelming really. Many people like Dylan songs better when someone else sings them. I remember the shock on my students’ faces, mostly the young men, when they learned that Guns and Roses didn’t write Knocking on Heaven’s Door. Greater shock, disgust really, among the young women when I played Dylan’s version of Make You Feel My Love. This, of course, is Dylan’s genius. His songs transcend artist and category and voice. They are uniquely their own which ironically makes them universal in possibility. This relationship between particularity and universality is precisely what makes the gospel significant. It is the fact that Jesus appeared in a particular time and space, a completely unique event, that allows it to be universal–that is, appear again in every particular time and space. But I digress. Today I am culling from the list of 73 a few for a long run playlist. I only need 40 minutes or so and I’m going with more up-tempo stuff. Here’s what I’ve got for today. We’ll see if any of them are keepers for October. 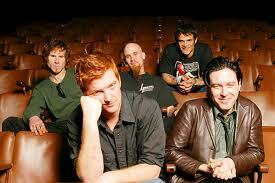 Queens of the Stone Age are the early favorites to make the marathon cut. This entry was posted in Music and tagged Bob Dylan, Jack's Mannequin, Jackson Browne, Jeff Beck, Lenny Kravitz, My Chemical Romance, Pete Townshend, Queens of the Stone Age, Seal, Silversun Pickups, Ziggy Marley. Bookmark the permalink. Check out Micah P. Hinson on YouTube and his covers of Times They Are A’Changin and Not Dark Yet. One on stage and one in a stairwell in Spain. I love Flogging Molly but the uptempo of The Times… just sounds like fingernails on a chalk board. Ones I do like not on your list: Eric Burdon Gotta Serve… The Belle Brigade and since you mention Silversun Pickups which with K’NAAN’s With God… are probably my two favorite tracks right now. Craig, I like the Flogging Molly, Burdon and Dennen covers as well. I also like the Thea Gilmore cover of I Remember You. My list for today were songs that I thought would be good to run with. Alas, I had too much knee pain to really be in sync with the music today.